It will be wonderful for the students, staff and their families to get their eyes checked at our first eye clinic July 13-14. It will be the first time for most. We have hired two optometrists and two ophthalmic nurses to check 120 people in two days. If there are no problems it will take about 10-15 minutes for each one. The Doctors will check for any diseases and if there are any problems. They will treat when needed and refer any serious cases. They estimate that 10-15% will need glasses and about the same will have some type of eye problems or disease. God bless Connie Damon. She put the word out and got 500 pairs of used glasses donated through her church, community and the Lions Club. I will be taking them back next week. They will cut the cost of glasses from $60 to $20 each. We will have enough for years to come. We also plan to share with EYE CARE,org. who are going to be putting on a eye clinic later this year. 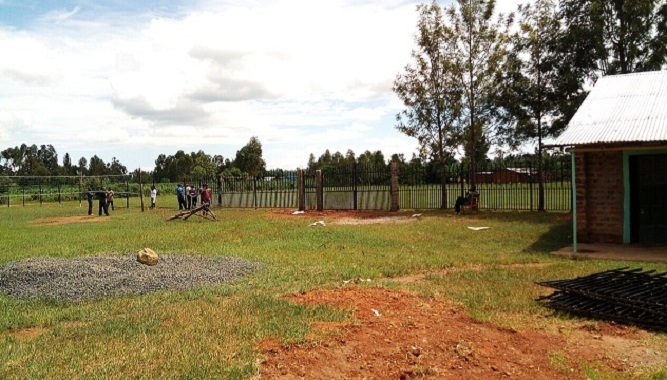 They serve 3000 orphans and HIV patients in the Webuye area. What a blessing! The Kenyan government has never set aside 1 shilling for eye care. There are NO government programs or special rates for Kenyan citizens or children. The country has only one hospital where eye surgery is done. 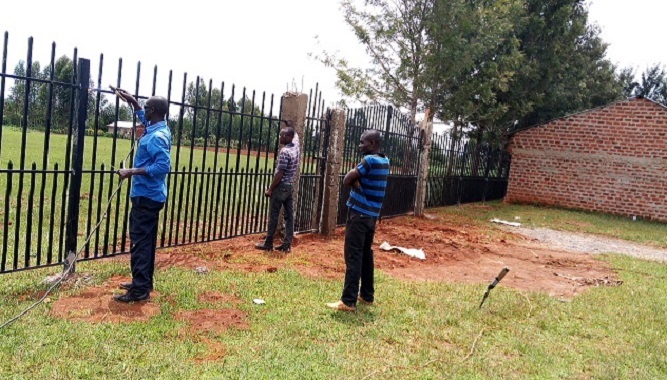 It is private and too expensive for all but a few people. It is far away and transportation and overnight accommodations are costly. Our goal is to have an annual eye clinic to keep Living Hope Students and the community’s eyes healthy and bright. Thank you all for helping, donating, and praying for our success. 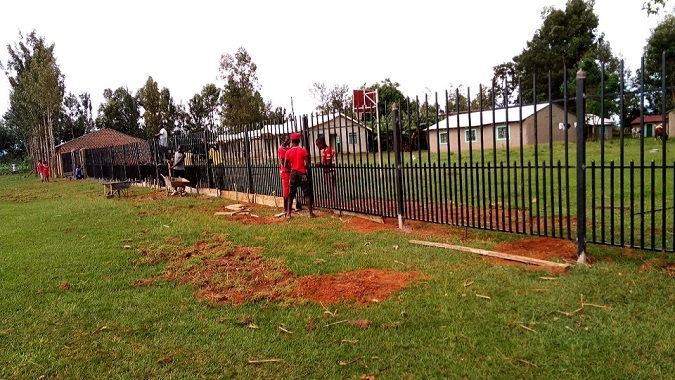 Due to the need to better protect the students from unwanted intruders who might harm them, it was decided it is necessary to construct a sturdy fence around a portion of the school property. 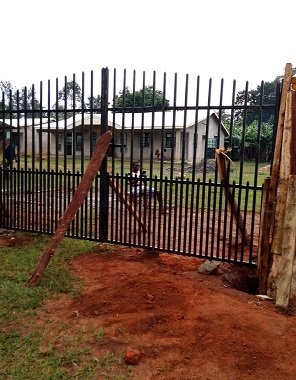 This fence will hopefully also lessen the problem of thievery, and it will keep neighbor's livestock from coming onto the school property to eat grass that is needed for the Living Hope cows. 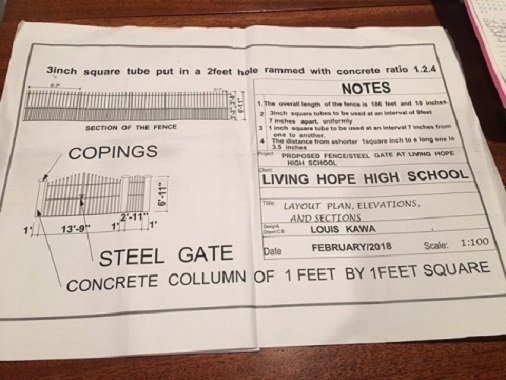 Marilyn secured Louis Kawa as the architect to draw up the plans for the fence and steel gate she chose. 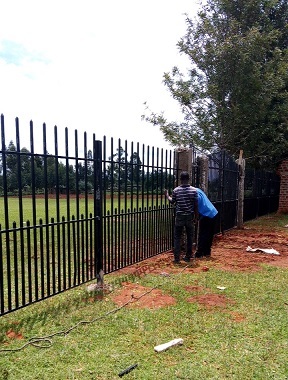 One of the school's graduates, Nick Simiyu, is heading the team building the fence. Jarrettown United Methodist Church in Dresher, PA is busy handling the fund-raising for the project.